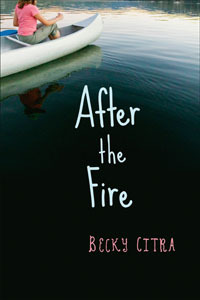 In this novel, eleven-year-old Melissa is trying to come to terms with her life after a fire destroys her family’s trailer home. Though she has recurring nightmares about the fire, Melissa refuses to talk to anyone about the fire, including her mother Sharlene, a single parent who has finally given up alcohol and is putting her life back together. A friend of Sharlene offers the family her cabin at a lake for the month of August. It is “real wilderness,” but the swimming is great and there is even a small, uninhabited island within sight of the cabin. Sharlene thinks it will be great for Melissa and her little brother, Cody, to spend time out of the city. Melissa thinks this will be just one more of her mother’s failed attempts to create a “new life.” Once there, Melissa reluctantly settles in. She learns how to paddle the canoe and soon ventures to the island. When she rounds a bend she discovers a girl, about her age, standing in the water. This girl demands to know if Melissa is “friend or foe.” Melissa soon becomes friends with Alice, whose family lives on a point of land at the end of the lake. Melissa and Alice spend nearly every day on the island, usually in a tree fort, supposedly built by Alice’s older brother, Austin, “the best brother in the world.” Alice also seems to have great parents. Melissa soon discovers that many things Alice tells her are just fantasy. Alice is writing a story and Melissa starts to wonder if Alice is confusing her own life with the life of the girl in her story. One day when Alice and Melissa come to the island, Alice’s brother, Austin, is just leaving and he is furious. Austin is carrying books and a sword that belong to him, which he has found in the tree fort. He rips up Alice’s story because he cannot believe she dared to “put Tristan in it.” Austin screams at her to keep her hands off his stuff, and that she makes him sick. Melissa just stands there in shock. Can this be the perfect brother Alice has so often talked about? And who is Tristan? As Alice’s “real life” story begins to unfold, Melissa comes to realize that her own family is just fine, and there is a chance for a “new life” after all.